Therapeutic wheatbags excellent for hot/cold compressions on tired aching muscles and sprains. 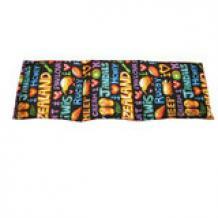 The wheatbags are made with 100% cotton and come in a wide variety of patterns. The wheatbag has three separate sections which allows even distribution of wheat and can be moulded to specific areas on the body such as shoulders and necks. Also with removable cover for ease of washing. Put in the freezer and you have a reusable cold pack ideal for providing soothing cold therapy.